For the last 18 months the Tiny 3 have been watching a DVD called Heroes Of The City, and even though they know it almost word perfect it is still a firm favourite with them all. They were so happy earlier this week when I looked up the new Heroes of the City you Tube channel and with the help of chromecast streamed it to the TV. Heroes of the City is a charming 3d animated series centring around the main characters, Paulie Police Car, Fiona Fire Engine and Alice Alarm who together help the townspeople find thieves, put out fires and solve any number of problems and mysteries. Another character which is a firm favourite in our house is Calamity Crow who gets into all sorts scrapes and is usually inadvertently the cause of many of the problems. 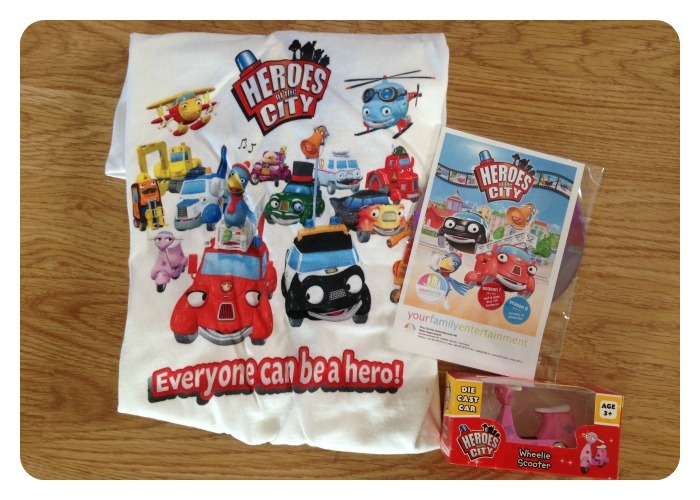 To celebrate the launch of The you tube channel I have a lovely Heroes of the City prize bundle to give away to 1 lucky reader. Just enter using the form below. Fiona Fire Engine and Pauli Police Car! Hi there! I’ve come over to visit from the Blog every day in May link to say hi- trying to nip over to everyone!